It appears plenty of people are already aware of the awesomeness of A. Lee Martinez, and as usual I’m just way behind. I first heard of the author only earlier this year, when I saw the title and cover for The Last Adventure of Constance Verity. How could I not be intrigued? Is Constance the badass looking woman smiling smugly at the viewer, apparently after having taken down a bunch of cultists single-handedly? And why might this be her last adventure? I wanted to KNOW. If there’s one thing’s for sure, this book caught my attention right away. Indeed the story does star our eponymous heroine, and things kick off with one hell of an introduction. Going incognito as “Connie Smythe”, our main character attempts to start her “ordinary” life by getting an “ordinary” job. However, the moment her would-be employers find out about her true identity, the seemingly everyday interview takes a turn for the bizarre as they try to dispose of Connie by sacrificing her to the Hungry Earth monster. Just another day in the life of Constance Verity. Trouble just seems to follow her everywhere, much to her annoyance. All she wants to do is live a normal existence, but just how is she to do that when disasters like alien invasions, time traveling supervillains, or space pirates just keep falling into her lap? This has been the case for most of Connie’s life. Whether she likes it or not, she is destined for heroism and adventure, thanks to a wish granted to her at birth by her fairy godmother. But now Connie has had enough of all of that, and just wants to settle down. Clearly, the blessing (or curse?) isn’t going to let that happen, so she’ll just have to do something more extreme: Constance Verity is going to kill her fairy godmother and take back control of her life. This book is the latest addition to what I have labeled my “fantasy comedy” shelf. Martinez goes to town riffing on our beloved tropes from classic action-adventure and pulp stories, combining the humor with paranormal elements. There’s even a running joke between Connie and her trusty sidekick Tia, with them always making references to her past escapades, each one sounding more outlandish than the last. Our heroine has seen it all, from foiling evil supervillain plans take over the world to escaping so-called inescapable sure-death situations James Bond-style. Despite this ostensibly cheesy shtick though, it really works. This story deftly toes the line between satire and homage, so that the premise comes off as being more witty than cornball. And though Constance Verity is meant to be an amalgam representing a number of our favorite larger-than-life heroes and heroines from classic pulp, she’s surprisingly easy to relate to. Of course, no one can claim to have a life quite like hers, but her desire to achieve some balance between work and pleasure is something a lot of people can sympathize with. It’s also clear after a while that Connie is chasing a pipe dream. After having done the extraordinary things she’s done, there’s just no going back to “normal” for her; not now or ever. We’re along for the ride as Connie discovers this for herself through much introspection and surprisingly profound discussions about determinism and free choice. Is Connie destined to live the rest of her life saving the world every day until she goes down in a glorious death as promised, or is it really just a simple matter of her refusal to turn away from a bad situation knowing that she has the power to help? Whether she likes it or not, Connie has the heart of a hero. The Last Adventure of Constance Verity is sure to give you plenty of good laughs and some deeper themes to chew on. It’s unexpectedly charismatic and offbeat, and I think of all the fantasy comedy novels I’ve tried this year, so far this is by far my favorite. It’s funny and farcical without being puerile, entertaining without feeling forced. All in all, I had a wonderful time with this book, and I will certainly be looking into picking up more books by A. Lee Martinez! I find fantasy comedy can be hit or miss depending on the humor you like, but it can be really fun if you find a book whose style works for you! Hmm.. The “comedy” aspect of this sounds like it might not be the best choice for me. Glad you enjoyed it so much! I love then sound of this one and as you enjoyed it and we tend to agree on so many books then this goes on my wishlist! YES!!! A. Lee Martinez! I really love his stuff. I was pretty excited about this one and scooped it up a few months ago… where it’s currently sitting on my TBR pile right next to a couple of his other books I have yet to get around to reading. For some reason I seem to only get around to reading one of his books a year and I apparently met the quota earlier by reading Chasing the Moon. I think it’s because I tend to associate his books with winter time reading for some reason. 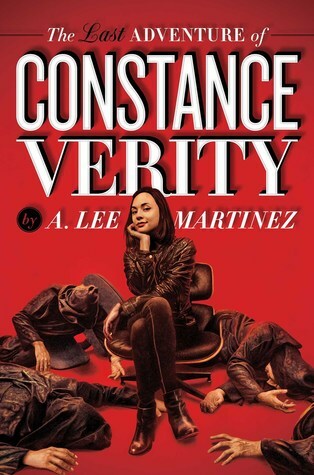 Hahaha, once again I feel like I was the last person on earth to read A. Lee Martinez. I really enjoyed what I saw though, I’ve already added one of his old books to my reading list. Hope you get a chance to read Constance Verity soon!